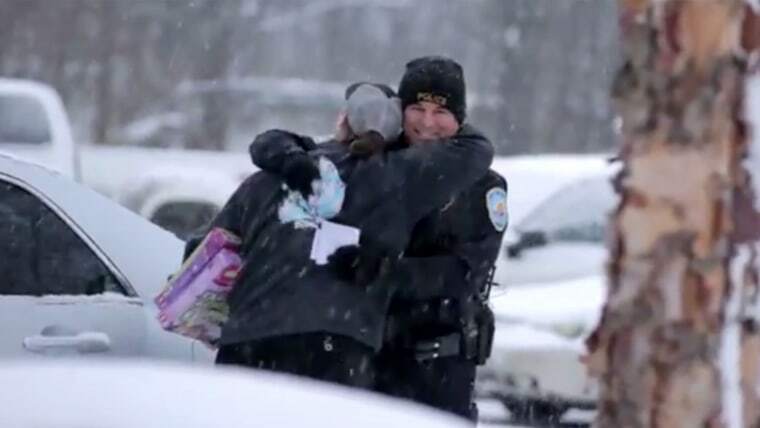 In Lowell, Michigan, unsuspecting drivers who thought Officer Scot VanSolkema was pulling them over for minor traffic infractions instead received presents from their holiday wish lists. Filmed Nov. 19 and 20, and posted Tuesday on YouTube, a video of their interactions has started to go viral, collecting more than 13,000 hits in mere hours. Wearing a hidden camera and microphone on his shirt, VanSolkema asked drivers what they wanted for the holidays. His microphone picked up their answers, and his colleagues raced around a nearby store to try to track down whatever the drivers mentioned and drive it to the scene. Motorists wound up driving home with toys, an Xbox and a high-definition TV, among many other presents. The video represents the creative collaboration of the Lowell Police Department, videographer Rob Bliss and the UP TV network. Lori Hall, UP’s vice president of consumer marketing, said the video is the latest initiative of a greater network campaign called Uplift Someone, which encourages people to deliver acts of kindness. “We wanted to do something that basically encouraged people to uplift someone, no matter how big or small,” she added. A few weeks ago, UP approached Bliss, whose previous works include the New York City cat-calling video that went viral this fall, about creating a video about good deeds. That’s when Bliss pitched working with his hometown police department to pull it off. Det. Gordy Lauren said Bliss first met with Lowell Police Chief Steve Bukala to work out the logistics of the project, which began pulling over people for minor infractions that police would normally let slide. Bliss said he filmed the footage of the crew that raced around the store to track down and transport the presents to the lucky drivers. Additional members of Bliss’ film crew shot supplementary footage across the street from VanSolkema. Drivers who were hesitant to share their dream gift ideas with VanSolkema — or simply wanted to get to their destination — were allowed to go on their way, Lauren said. Bliss guessed that about 1 out of 3 drivers left before they had the chance to get a present. At a time when police are under intense scrutiny and criticism — especially following the deaths of Michael Brown in Ferguson, Missouri, and Eric Garner in Staten Island, New York — Bliss said he hopes his video will remind viewers about good police officers and their dedication to service. “I was really happy to bring this project, just to show some of the really kindhearted [police] that are out there,” Bliss said. Taxpayers can breathe a sigh of relief, too, as the police department didn’t have to foot the bill for the gifts they distributed. UP sponsored the project, with Hall estimating that between $7,000 and $10,000 worth of merchandise was given away over the two-day shoot.